With this application you will easily split a field defined by an irregular polygon in so many parts with the same surface as you want. Every perimeter line is solved by TOP-Parcel, even if it has curved parts. You can configure the way in which the programme will be carried out field divisions and even label each obtained plots. It divides the field into as many parts as you want in seconds! To sum up; with TOP-Parcel you will solve a very difficult and laborious situation, using your CAD software and in just a few seconds! We invite you to discover all of our architectural and drawing tools. You will save a great deal of time and gives you more time to design! 1. DIVIDES AN IRREGULAR POLYGON SURFACE AT ONCE: With this program you will divide any surface contained in an irregular polygon into as many parts as you want, automatically and at once. The user only has to define one orientation line marking 2 points in the drawing. 2. CONFIGURE THE WAY OF MAKING DIVISIONS: In the program window you are able to define how divisions will be solved. You can do it in a parallel or perpendicular direction (taking the orientation line as a reference). 3. AUTOMATIC PARCEL LABELLING: This program automatically labels each parcel displayed. The type and the information displayed in the label are fully configurable. You can name the plot and show the surface data in the most suitable units. 5. GET DIFFERENT SOLUTIONS: One plot of land can be divided in endless ways, simply by changing the orientation of the divisions. 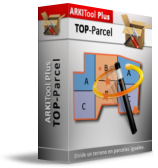 With TOP-Parcel you can have multiple solutions for one plot in a few minutes. 6. EASY TO USE: TOP-Parcel cannot be easier to use, only has to indicate the number of divisions and the way of making them. Then on the drawing, select the polyline which contains the plot and mark two points to define the orientation of the divisions. TOP-Parcel will make all the work for you! 7. HELP AND SUPPORT UNLIMITED: If you have any questions using the program we offer unlimited help and support.